The Moto G5 Plus has been launched in India. The phone has a precision crafted metal design, with a diamond cut high grade aluminium finish for the back panel. The G5 Plus has a splash proof design, and sports a 5.2-inch Full HD 1080p display, with a pixel density of 424 ppi, and has Corning Gorilla Glass 3 protection, which is scratch resistant. The device runs on Android 7.0 Nougat with Google Assistant (post an online update), Moto Actions and Moto Display. Moto Display allows you to see the notifications, time, etc, without powering the device, while Moto Actions are smart gestures which allows you to quickly launch the camera with a double twist, or double twist again to switch to the front camera. The device is powered by an octa-core Qualcomm Snapdragon 625 processor, clocked at @ 2.0 GHz. The phone will come in two variants which have 3GB/4GB of RAM, and 16GB/32GB of storage, along with a dedicated microSD card slot. The Moto G5 Plus has a front-facing fingerpront scanner. The phone has a 12 MP rear camera with dual autofocus pixel, and an f/1.7 aperture. It offers advanced camera controls for White Balance, Shutter Speed, ISO, Exposure, Focus. The front lens is a 5MP wide angle selfie camera with beautification features. The phone is backed by a 3,000 mAh battery which supports Turbo Charge. While mentioning about NFC support in the G5 Plus, Anuj Sharma hinted that Android Pay could be coming to India. 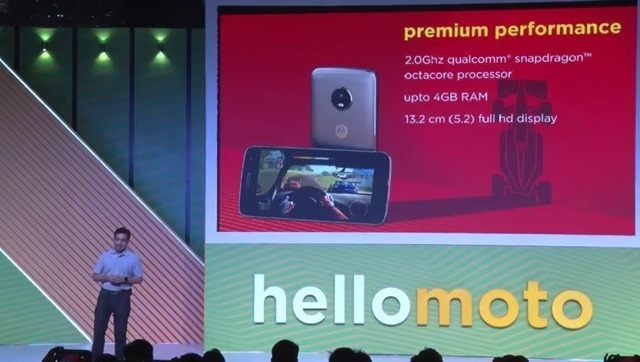 Anuj Sharma took a dig at most OEMs releasing similar looking Phones (think Redmi Note 3 and its look-alikes), and that people will not mistake the Moto G5 Plus. because it looks different. The Moto G5 Plus has been priced at Rs. 14,999 for the 3GB RAM variant, while the 4GB RAM variant costs Rs.16,999. The phone will be available from midnight today, exclusively from Flipkart's website. 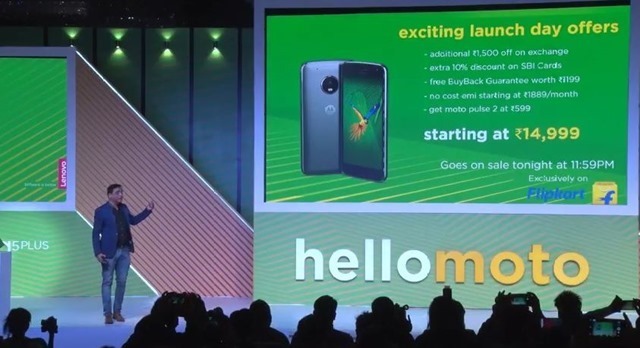 Motorola and Flipkart has launched a new offer called the assured BuyBack program, which offers a guaranteed Rs. 7,000 back, when you upgrade to a new Motorola phone. Apart from that there are some cool launch offers, with which you can get an additional Rs. 1500 off on exchange, extra discount of 10% off on SBI cards, no cost EMI at Rs.1889/month, and an option to buy Moto Pulse 2 wired headset, at Rs. 599. You can read more about Flipkart’s BuyBack guarantee at the official website.